Parents play a vital role in their child’s education. They are equal partners in the team that develops their child’s IEP and they care deeply how their sons or daughters learn and grow. In the course of their child’s education, parents may interact with a large number of professionals. 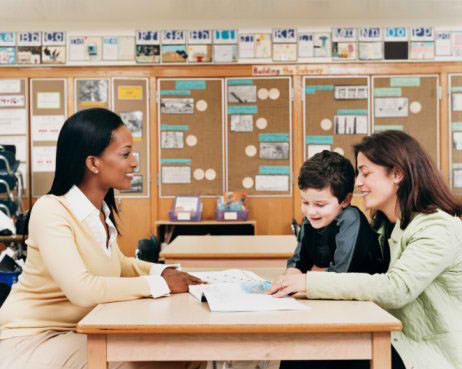 Being able to work effectively with different professionals, exchanging ideas concerns and openly communicating about what’s working and what’s not, are all important elements in their child’s educational success. The Basics Remember that, as a parent, you know your child best and have the greatest investment in him or her. You need to diplomatically but strongly advocate for your child. Be aware that parents have a lot of power. Don’t wait for two months to check in for results. If something is not resolved quickly, work on it. Teachers don’t always have as much leverage as you think. You may be able to help your child’s teacher resolve something much faster. Work as a team. Remember that working with the school can a very emotional, personal process, because this is your child. It’s very easy to feel defensive. Try to describe your needs in behavioral terms, not emotional terms. Keep things in perspective: Ask yourself, “Is what my child is doing typical for his age group, or does his behavior have to do with his disability?” Encourage those who work with your child to do so, too. Know that everything you do is not written in stone. You can change things. Just because you decided something at the end of June doesn’t mean you have to do it for the next year. You can change it at the end of October if it’s not working. You can call the committee back and ask to reevaluate the situation. . Remember to think of your child first. The disability is just part of who your child is. Remind people of your child’s strengths. Encourage teachers to praise him or her. If you are not sure about how to talk with teachers, connect with other parents. It’s like an adult buddy system. Talk to other parents about what they are doing. You can get a parent advocate to work with you someone who’s gone through what you’re going through. In order to get your point across or convince people to try something they might not be inclined to do, be positive and enthusiastic. Be very upfront and give them factual information about your child’s needs to alleviate their fears. Explain the reasons you want something done, then suggest ways to do it. Convince people to try new activities or approaches before disqualifying them, even if it’s for a trial time of one month. If you feel that decisions are being made without you, call and ask to be included in discussions. You can suggest a “pre” IEP meeting to talk about some of your ideas and what your goals and the goals of your child are. This is especially helpful for meetings that involve therapists and/or both special and general education staff. By talking before the meeting with the specific people who are responsible for your areas of concern, you can structure the formal meeting so it goes smoothly and so the entire group can sign off with only one meeting. Write letters or make calls to say thank you when things are going well. It’s always a good idea to let educators know about successes, especially those that occur outside of school. For really successful occurrences, send a copy of your letter to the principal or supervisor, so he or she, too, will know wha a great job your child’s teacher is doing. Even if you don’t agree with the methods that are being used, if your child is improving, recognize it. Maintain a “we” attitude. Ask how “we” can work together to solve a given problem. .
Write articles to the local paper about one of your child’s success stories. It’s good for the school, the teacher, and your child. If you’re part of a parent group, consider inviting teachers and/or administrators to a meeting every now and again. They are probably curious about what parent groups talk about and would appreciate being included in discussions. Their perspectives are often very enlightening, and they may have concerns that never occurred to the parents. Remember, inclusion isn’t only for kids. Support the people who work with your child even when things aren’t going as well. Encourage them to keep trying, that tomorrow will be better, and how you appreciate their efforts on your child’s behalf.